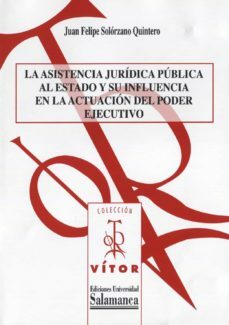 These investigations discuss the Legal Public Assistance to the State and its influence in the performance of the executive power. For the execution of this thesis we depart from the analysis of the Constitutional Laws postulates. This situation makes this research original because many studies that have been done about this topic describe the procedural or historical aspects. For these previous reasons we structured the investigation by two affirmations. The first one consists in the fact that the constitutional model has to adapt itself to the necessities of the citizens. Therefore every person is determinant for the juridical order. In this sense the Constitutions establish the centrality and the importance of the human being as a holder of dignity. This principle is the inspiration for the juridical legislation. In this way the constitutions settle principles; values and rights that are unavoidable to the public powers. The second affirmation or premise is related to the first one because the constitutional norms are binding for the public powers. Particularly we decided to study the executive power. There have been created different concepts in order to preserve every single constitutional postulate that obliges the executive power. In order to fulfil these principles there exist public institutions that are in charge of advising the government and the administration when they take public decisions; and they also defend the general interest in Court. These functions of assistance; prevention and defence form what we consider the Legal Public Assistance to the State: an institution that not only guarantees the legality of the public performance; but also represents and preserves the general interest.